TORONTO, ONTARIO, September 25, 2017 ― Nippon Telegraph and Telephone Corporation (NTT) and Toyota Motor Corporation (TMC) have commenced joint research with the aim of promoting the use of partner robots that can help and coexist harmoniously with humans. The research aims to provide support for various situations that occur in daily life utilizing AI technology (corevo®) from the NTT Group and the Human Support Robot (HSR), one of the partner robots currently being developed by Toyota. Previously, robot development focused primarily on industrial robots in factories and other workplaces fulfilling tasks in place of humans. However, in recent years, as observed in products like robot vacuum cleaners, increased attention has been given to partner robots. Partner robots operate inside homes and can help with such tasks as housework, nursing and child raising, or acting as a partner with which to communicate*. 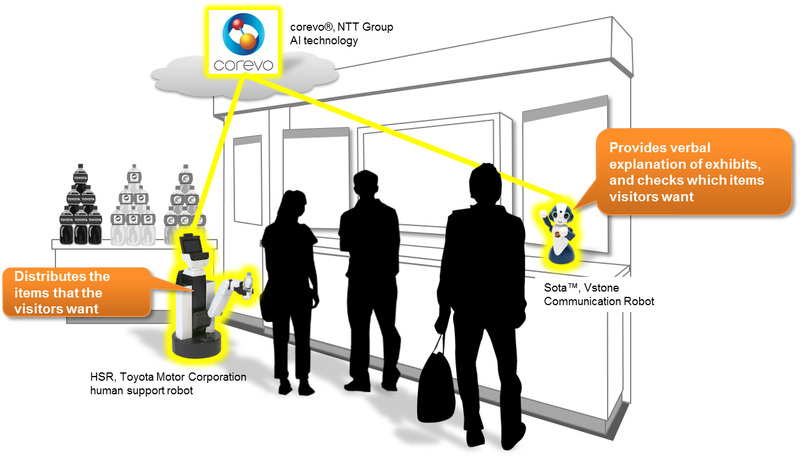 NTT is engaging in the research and development of corevo®, which incorporates media processing technologies with world-leading levels of accuracy (the company's voice recognition technologies being a prime example) and interaction technologies such as R-env® so that robots and other personified agents operating on corevo® are able to understand human words and expressions, as well as understand advanced discussions that incorporate hand and body gestures. Through its collaboration with various manufacturers, NTT has promoted initiatives that equip robots with a variety of different characteristics to become more integrated into human life. Toyota, meanwhile, has advanced development of HSRs that are compact and lightweight, easy to operate, and that provide safety and peace of mind. The company intends for HSRs to operate inside the home, live together with people, and support even more bountiful lifestyles in the future. In 2015, Toyota established the HSR Developers' Community in collaboration with multiple universities and research institutes. The goal of the community is to accelerate technological development in order to improve the functionality of HSRs. In this joint research effort, NTT and Toyota aim to combine their technologies and know-how and focus on communication robots incorporating corevo® and HSRs. By linking a wide range of robots and other devices, the two companies aim to promote the development of technologies that can anticipate and provide support for human activities. In addition, the two companies expect to create service prototypes for event halls and commercial facilities that visitors and actual customers can interact with. In doing so, they aim to verify end-user reception and effectiveness of the prototypes, as well as to identify any technological problems for future application. The ultimate goal is to promote the application and widespread use of partner robots that can coexist harmoniously with humans. NTT plans to provide voice recognition, dialogue control, and synthetic voice technologies developed at its research laboratories that enable dialogue between humans and robots in natural language. It also plans to provide corevo®, which incorporates R-env®, a technology that enhances non-verbal interaction between humans and robots by connecting robots to other devices. At the same time, NTT will construct service prototypes and identify technological problems that may affect the use of HSRs in a variety of situations. At the same time, Toyota plans on conducting field experiments necessary for verifying the technologies, end-user reception, and effectiveness of HSRs with the aim of expanding their fields of use. Initially, service prototypes will be exhibited at the NTT booth at CEATEC JAPAN 2017, which is scheduled to be held at Makuhari Messe from October 3-6, 2017 (Figure 1). Afterwards, demonstration tests will be carried out in the field, such as at robotic events and showrooms, with the purpose of allowing NTT and Toyota to gauge the possibilities of robotic services centered on HSRs. In addition, NTT expects to release the usage environments of corevo® to external parties. By expanding collaboration with other manufacturers, universities, and research institutes, NTT and Toyota hope to identify and promote the technological development of functions necessary for humans and robots to coexist. The two companies aim to realize a world in which partner robots are not only intelligent, but also gentle, and increasingly able to get closer to humans and encourage humans, their activities, and their growth.